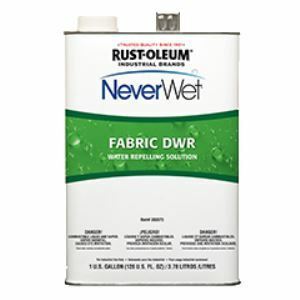 Rust-Oleum® NeverWet® Fabric DWR is a one-step, superhydrophobic, durable water-repelling treatment that has been designed to keep items dry longer. Rust-Oleum® NeverWet® Fabric DWR is a one-step, superhydrophobic, durable water-repelling treatment that has been designed to keep items dry longer. This crystal clear formula allows fabrics to breathe, while dramatically repelling water from the surface. NeverWet Fabric DWR preserves items against damaging moisture without changing the look or feel of the fabric. Apply using a spray bottle or air atomized spray gun.